We are spending our first night of our Ireland vacation in Clifden, County Connemara, in the west – Joyce Country. Some Day . . . Throughout my life I’ve often wondered if I would ever really know for what work I was created; know if I will ever become the person I was meant to be. Am I exactly where I’m supposed to be? I guess I’ve never stopped looking for the answers. Maybe that’s why I’ve had so many different jobs and played so many different roles in my life. Maybe that’s why I’ve always had a hard time calling any one place “home.” I wonder if I will ever know. I actually wrote quite a bit yesterday, but at the end of my day I had nothing to post. I had plenty of words, but no complete thoughts. My brain was full of disconnected one liners and incomplete phrases. I have a tendency to pause when I talk as I search of the correct word to say (which drives people nuts sometimes), and my my mind was doing the same. The problem was, my fingers couldn’t find the write (sic) words. So, it goes. I remember the world my best friend and I created as children. We grew up in a small town in the southwest Arizona desert, and the desert that surrounded us was our playground. With a clear sky and wide open space, our imaginations had no limits. We fought battles with rocks and sticks, against enemies larger than life, and we would always win. The desert hills became mountains with dangerous cliffs and grand summits to conquer. Our adventures were epic. We saved the world every day. We were each other’s heroes back then, and we believed in each other’s dreams. But one day, I’m not sure when, those childhood dreams were replaced by grownup “reality” and imagination seemed to die. I use the word seemed because when my childhood friend and I get together, once a year or less, I can’t help feeling like we never left that world we created in that Arizona desert. Somehow, we still look at each other’s life as a continuation of that adventure that started so many years ago, and we still believe in each other’s dreams. My friend is still my hero. I love this time of year, and one of the things I always look forward to is the appearance of the bright, yellow Forsythia blossom. 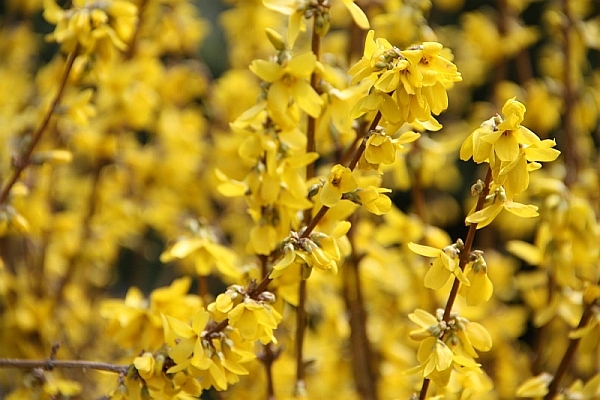 This fascinating plant only blooms once a year, its flowers lasting for about two weeks, but it signals the start of Spring with a blast of color.”When the forsythia blooms, it’s time to prune the roses,” as the saying goes. The forsythia blossom also reminds me that it’s time to trim and prune away those things in my life that keep me from growing and fully being me. It’s time to prune my roses. I apologize for this one. I tried writing something worthwhile for a couple of hours (or more), but couldn’t come up with anything worth posting. So, I just started typing – I let my fingers do the thinking – and this is what I got.